The U.S. Food and Drug Administration (FDA) has approved dinutuximab (ch14.18) as an immunotherapy for neuroblastoma, a rare type of childhood cancer that offers poor prognosis for about half of the children who are affected. The National Cancer Institute’s (NCI) Biopharmaceutical Development Program (BDP) at the Frederick National Laboratory for Cancer Research produced ch14.18 for the NCI-sponsored clinical trials that proved the drug’s effectiveness against the disease. “It’s pretty cool,” said Doug Gaum, director of Quality Assurance at BDP, which also provided technical and regulatory support in transferring the technology, under an NCI Cooperative Research and Development Agreement, to United Therapeutics Corporation of Silver Spring, Md., and Research Triangle Park, N.C., for commercial production. Neuroblastoma arises in infants and young children as a tumor of immature cells of the peripheral nervous system. More than 650 cases are diagnosed each year in North America, mostly in children under age 5, and more than one-third of these cases are diagnosed in infants. Half of all patients have a high-risk form of the disease and a poor prognosis. Dinutuximab is designed to benefit these high-risk patients. It was a long road to clinical approval. The lead scientist and study chair of the clinical trials, Alice Yu, M.D., Ph.D., University of California, San Diego, began pursuing ch14.18 as a cancer treatment about 25 years ago. 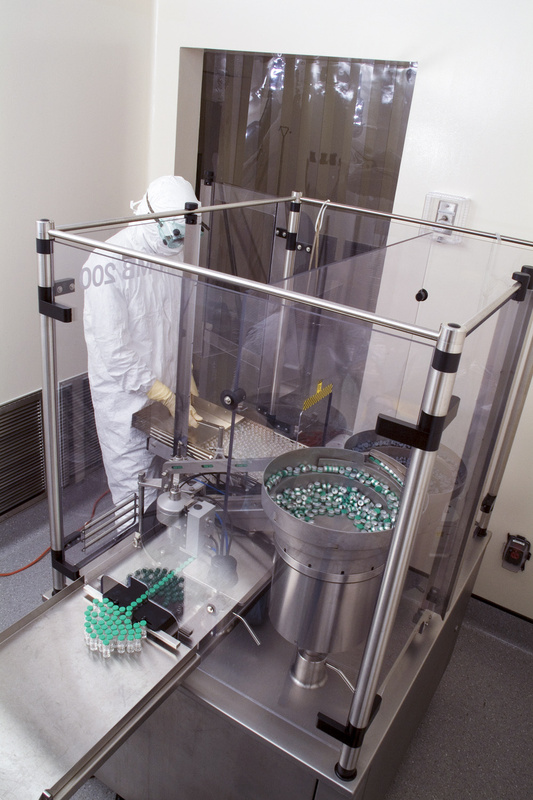 BDP began producing the antibody for human testing in 1997. The Biopharmaceutical Development Program filled, stoppered, capped, and sealed the ch14.18 antibody prior to its labeling and distribution to the NCI Cancer Therapy Evaluation Program. During the Phase III trial in 2009, an interim analysis of results showed that ch14.18, given along with two immune-stimulating agents, was definitively effective. Among the 226 patients (median age 3.8 years) who received the combined therapy, 66 percent were alive and free of neuroblastoma after two years, compared with 46 percent in the control group, who received only the standard therapy. As a result, the control group began to receive the combined therapy right away, and this became the new standard of treatment for pediatric neuroblastoma. Patients from the United States, Canada, Australia, and New Zealand enrolled in the trial to receive the drug, and BDP manufactured additional supplies to meet the demand. Results of the clinical trial were published in the New England Journal of Medicine in September 2010. “After decades of pursuits, I am pleased to see that dinutuximab has received FDA approval and may now benefit high-risk neuroblastoma patients,” Yu said in a news release from United Therapeutics Corporation, which will manufacture and market the drug under the brand name UnituxinTM. “This is not only the first successful immunotherapeutic to target a non-protein antigen, but also to be developed from an Investigational New Drug application through Phase III trials largely through investigator-initiated effort and NCI support,” Yu said. The FDA approval calls for using Unituxin in combination with two immune-boosting compounds (IL-2 and GM-CSF) and the anticancer drug cis-retinoic acid. Unituxin links to cells of the immune system (natural killer cells and granulocytes) and directs those cells to attack and kill tumor cells. Several members of BDP have been instrumental in supporting this project over the years. For Beverly Keseling, manager, Cell Culture, it was one of her first assignments when she joined Leidos Biomed, then named SAIC-Frederick, in the 1990s. Steve Giardina, Ph.D., a former employee, worked directly with NCI, the FDA, and Health Canada on issues of patient safety and product characterization. Keseling, Samir Shaban, manager, Manufacture, and their teams managed the bioreactor and purification units that worked extraordinary hours to ensure that the supply of ch14.18 met the demand for the drug during the transitional period prior to FDA approval. Sheryl Ruppel, director, Regulatory Affairs, and her group worked extensively with NCI’s Cancer Therapy Evaluation Program, the FDA, and Health Canada in developing regulatory submissions and ensuring that reviews stayed on track.